Home › Homesnap › What’s the Best Mobile Solution for You? What’s the Best Mobile Solution for You? To save you time and eliminate the guesswork, we’ve completely redesigned our NorthstarMLS Mobile app chart to compare the features of our most used mobile solutions available to NorthstarMLS subscribers – HomeSpotter (formerly known as the “NorthstarMLS app”) & Homesnap. With our newly designed and easy to read comparison chart, you can quickly find features that are most important to you to determine which app may be best for your real estate business. Can I edit listings? Does it let me share listings via email, text or social media? Is there integrated access to Instanet, ShowingTime, DPR or TrustFunds? Can consumers access data? 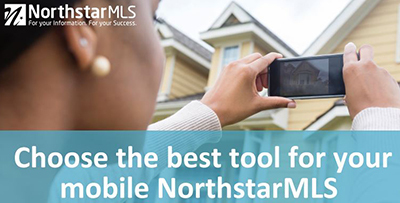 These are all features you can quickly compare with our new NorthstarMLS Mobile app chart.